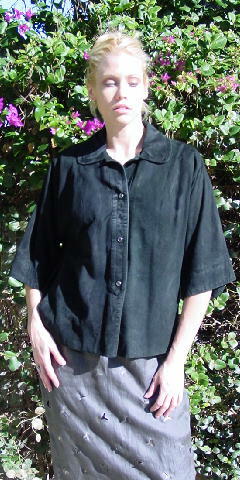 This vintage black (we don't know the fabric content) jacket has 5 iridescent gripper front snaps. It has 8 1/2" bottom open side seam slits that snap at the bottom and half-moon shaped side slit pockets. 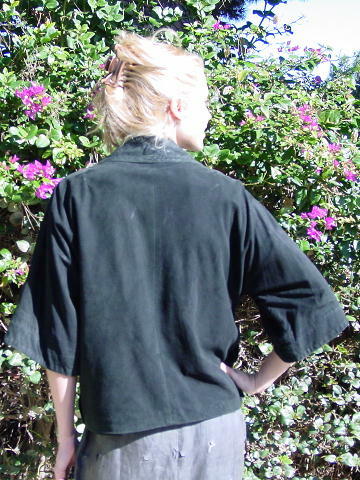 It has elbow length kimono sleeves that can be rolled up 1 1/2". There is some fading to the top of the back collar. It has a nice black lining and it's soft as suede. It has that ever-popular "well-loved" look. 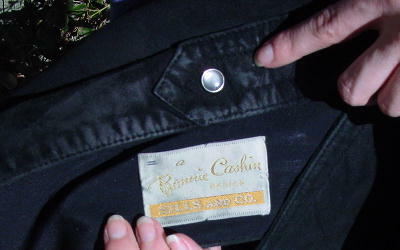 Bonnie Cashin (who was a designer for 20th Century Fox) was regarded as one of the mothers of American sportswear.